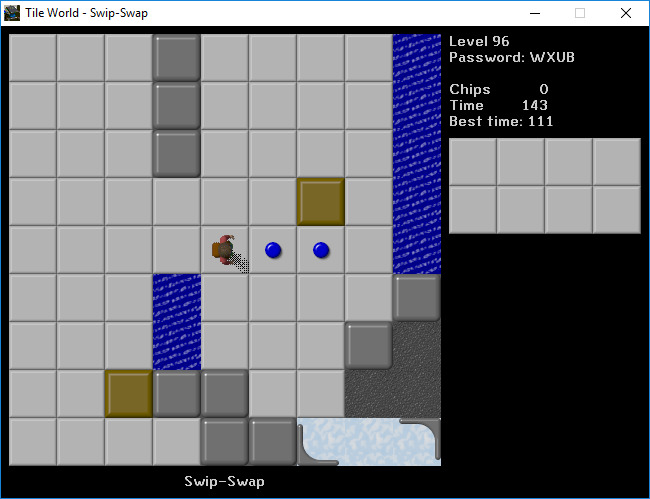 "The Other 100 Tiles" by ajmiam - Level Discussion - CC Zone: The Next Level - Chip's Challenge/Tile World website! It's finally done! The sequel to Pit of 100 Tiles is here! 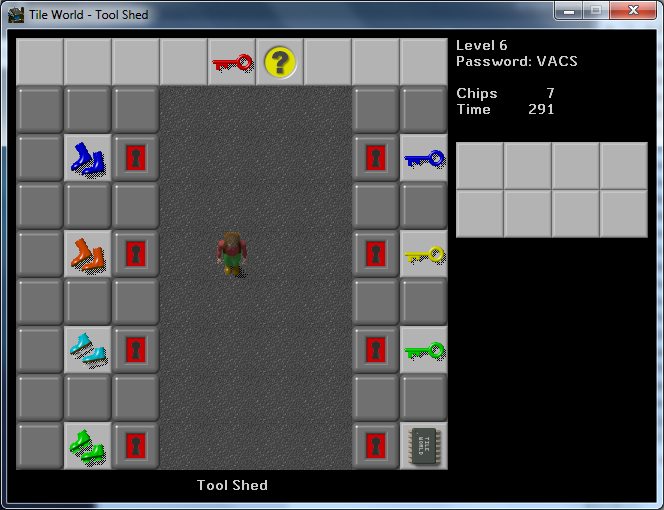 This is my second levelset, again containing 100 levels. 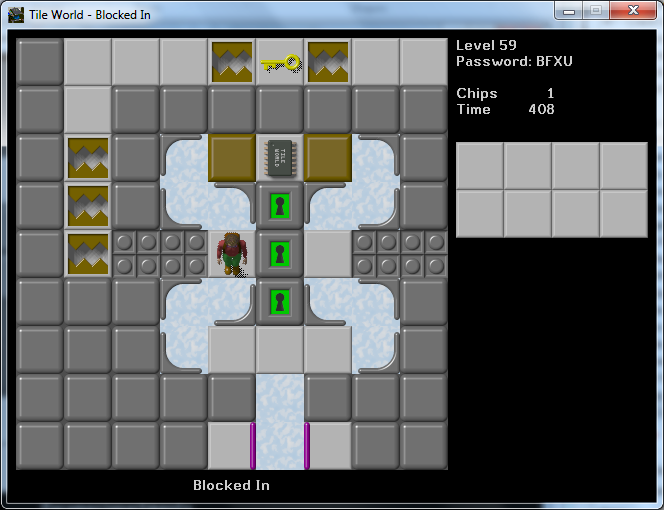 Some of the levels you may have seen already in CCLP1. 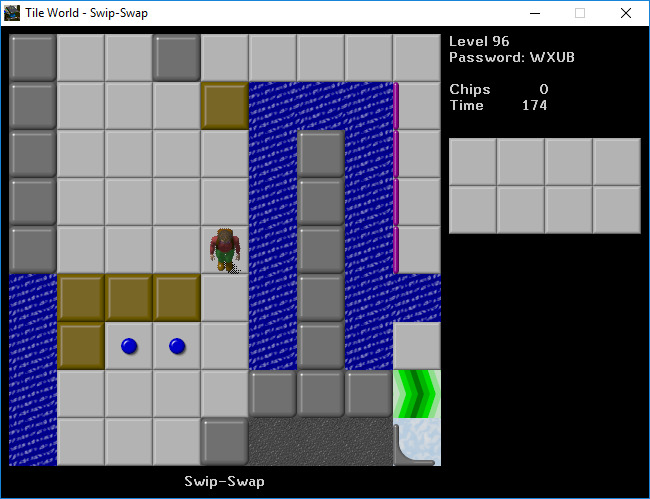 Several levels here are highly unusual or experimental designs, and some are follow-ups to concepts seen in Pit of 100 Tiles. The set is of advanced difficulty compared to Pit of 100 Tiles, so I recommend you finish that set and either CC1 or CCLP1 before playing this set. Be on the lookout for secret hints in levels 10, 20, 30, and 40. You'll need them to solve Level 50. I submit all of these levels for CCLP4 consideration, but only want Level 50 to be considered if the player would be given hints to its solution over the course of CCLP4, similar to how it is in this set. I would like to heartily thank Michael Warner, J. B. Lewis, Tyler Sontag, Ryan J., and Josh Lee for playtesting this set and providing feedback. Their efforts kept probably a dozen busts out of the final product. Please leave feedback and bug reports in this thread. As one of the playtesters for this set, I'll go ahead and say that if you haven't touched this one yet, you're in for a treat. Thirded as someone who didn't test and didn't play many levels from it until the full release. Tons of fun. 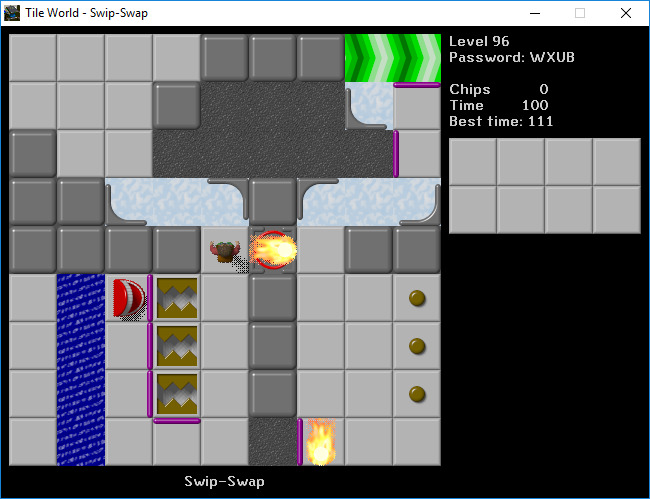 Couple levels took their concepts a bit too far with too many semi-precise timing moments (Parameciapartments and Falling Up the Steps), but overall I could see a lot of these levels doing well for CCLP4. Thanks to Jeffrey's feedback, I've made a few changes to levels 26, 49, 58, 60, 65, 69, and 88. The changes to Levels 49, 60, 69, and 88 will probably break existing solutions. The changes have been uploaded to CCZone. I do not plan to make any further updates except for fixing busts. Note that it's only 60% done right now. But if you have any feedback, please post it here! The To100T port is now complete! All 100 levels done! It's available from the link in my previous post. Good luck bonus hunting! May all your automatic doors be repaired, and may all your runs be perfect! I am almost done with this level set 95 of 100 levels completed so far. Just 5 more levels to go! . 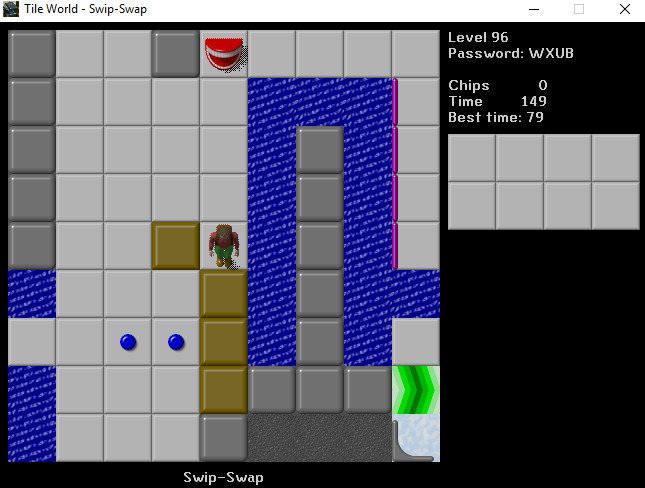 The level I am stuck on is Swip-Swap (96), which has a creative concept. I understand the objective of this level but there is something funny going on with the teeth going down after Chip and the tooth monster switch sides. I looked at JB's lets play of that level and sometimes it works and sometimes it doesn't, so I am totally confused . Is there some sort of odd even step required? 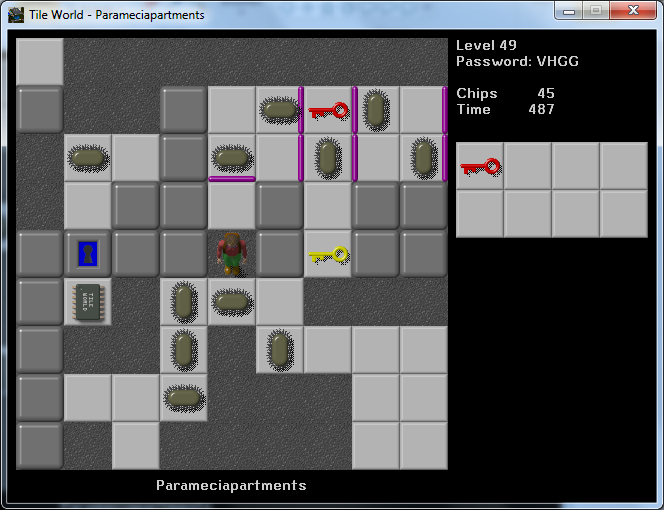 Anyway, overall as far as the level set in concerned it is slightly better than the original 100 tiles. 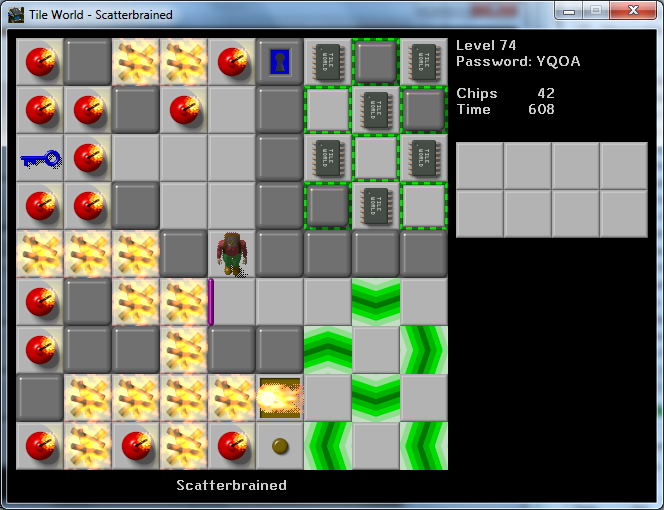 More creativeness is put into the levels along with new concepts introduced within the levels. In conclusion, I need some help on Swip-Swap, cause I am totally confused. I am almost there to the end and certainly looking forward to playing the final 4 levels of this great level. Thanks. Hi, mmoraleta, and happy holidays! I'm glad to hear you are enjoying the set, and congratulations on getting so far. 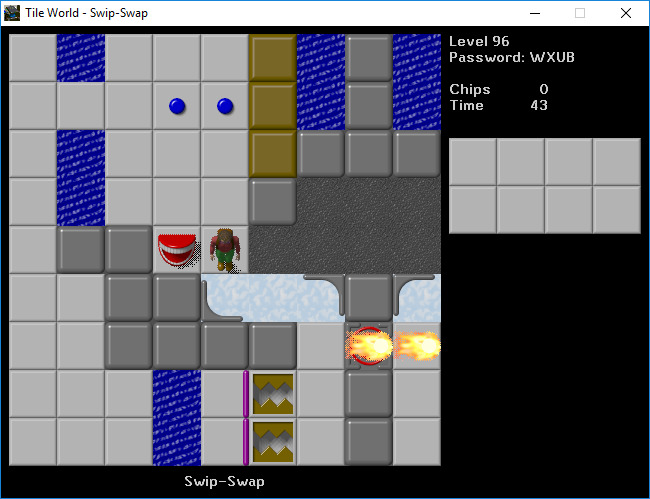 There are a couple of reliable strategies I know of to clear Swip-Swap. One involves using the blocks to make a wall with a "hook" on the top, holding the Teeth in place until you run around to the right side. Another involves bridging outside the left side of the level and back in further down, allowing you to get the Teeth caught on a level feature down there until you get around to the right side. JB's "just run for it" approach takes less work, but it's also less reliable (and it might not work in Lynx since he did do a backwards force floor step-off). 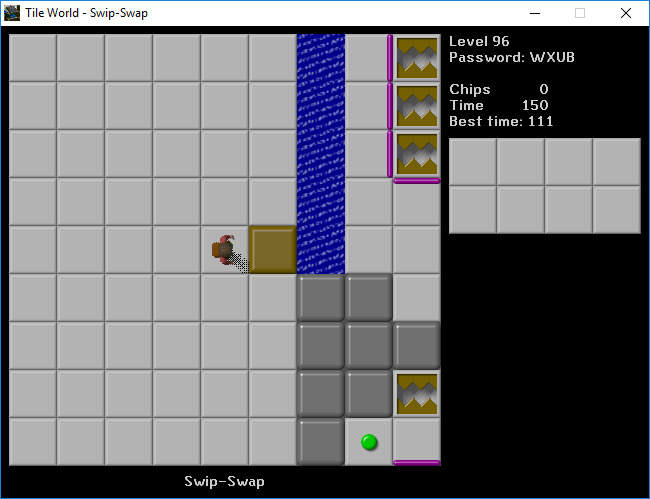 If you still can't solve the level, please let me know exactly what problems you are having and which ruleset you are playing (MS, Lynx, or CC2), and I will do my best to help. Thanks, ajmiam for your help. All 100 levels completed! I know that I've blazed through these levels in a fast pace but it shows has much I enjoy playing Chips Challenge in general and this set in particular. 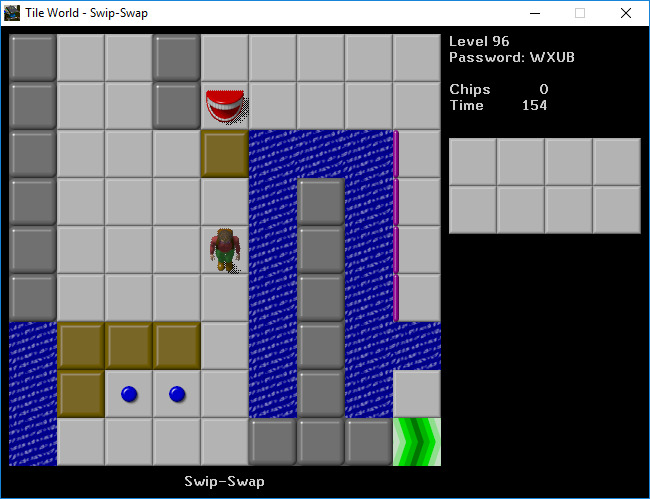 Chips Challenge was one of my childhood games back in the Windows Entertainment Pack Era. Anyway I hope you're excited for 2017 coming up! I really enjoyed this set a little more than the original 100 tiles since there was more challenging levels and more creative concepts. Again, I am thankful that this set along with the original had no unreasonable frustrating levels. Also, thank you for your solution for Swip-Swap, I was stuck on that level for some time now cause of that tank and tooth mechanism. 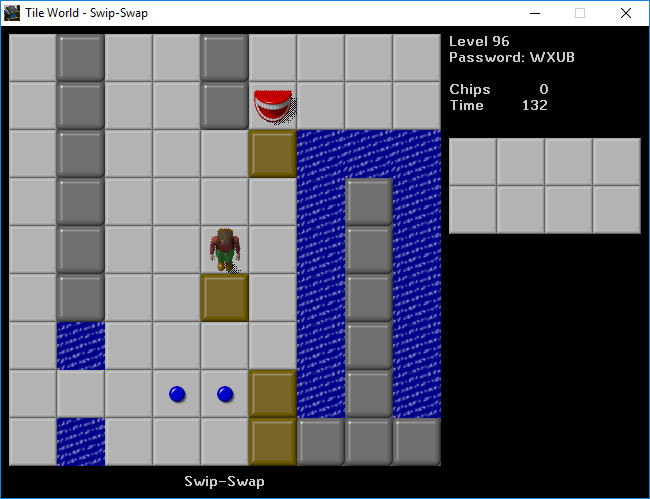 Some of my favorite levels in the set were Jigsee (94) and Jigsaw (99), two great levels that sort of correspond with each other and kind of let you do the level in any order you want in a scavenger hunt fashion. Block Unpuzzle (39) was also one of my favorites, I've never seen that kind of concept where you had to solve a sokoban and then "unsolve" it. All in all, this set is a little better than the original level set but stil a great level set and I definitely enjoyed this level set. Great job!